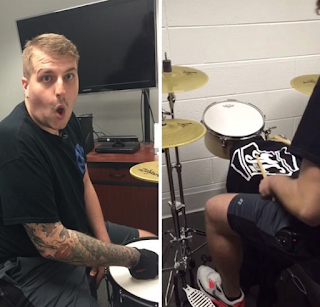 The Ghost Inside drummer Andrew Tkaczyk played drums for the first time since the band's terrible accident last November which caused him to require a leg amputation. You can watch a video below. Today was a huge baby step. I sat behind a drum kit for the first time since the accident, and it felt incredible. EVERY encouraging word and support from you all has gotten me to this point. I may not reply to every single person, but I've read EVERY single message/comment etc. from every single one of you. Thank you all so much for being on my side on this journey, it means more than words can describe. Also couldn't have done this without my TGI family and friends. Also my amazing sponsors at @sjcdrums @zildjiancompany And @vicfirth You're the fuel to my fire, now watch me burn.